Storm Gener is getting stronger as it hits Western and Northern Luzon. Tweet from ANC: for 10pm advisory: Yellow warning for Metro with moderate to heavy rains to continue for the next 3 hours. Floods possible. I just hope that there is no flood because of possible landslide in some low lying areas. There is no storm signal in Metro Manila but the wind started to blow stronger. I could feel the wind as it closed the door by itself with a big bang. As of 11:20pm, classes in many cities in Metro Manila are suspended. DepEd also announced suspension of classes in Manila tomorrow from Kinder to HS. Gener will bring heavy rain as the storm is expected to enhance the Southwest Monsoon. Binga, Magat and Caliraya Dams are now on spilling level. 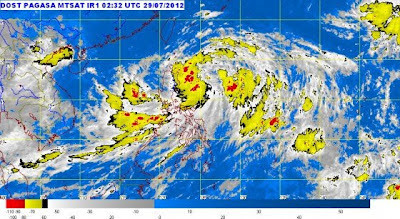 Stay indoors and watch TV or online news for weather update. Have a flashlight and radio with battery in case there is power interruption. Have enough supply of food and water. In case of flooding, turn off the main switch and gas. I like rainy days. Gives me time to relax and sleep. Kaya lang naawa naman ako dun sa mga naapektuhan. I hope you guys are okay naman dyan.